Tangela in game: 1,932 Who? Important notice! 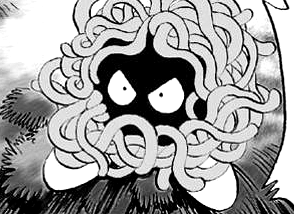 Pokemon Tangela is a fictional character of humans. 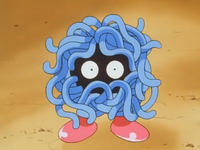 Tangela is covered with thick blue vines that obscure its face so only its eyes can be seen. These vines are covered in fine hair, and they give it a round shape. It is unknown what it looks like without them. The vines are always growing, and can be replaced if lost or damaged. It has a pair of red boot-like feet, but no visible arms. 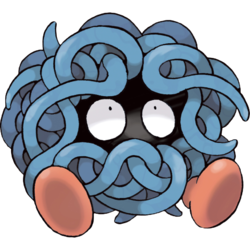 Tangela can ensnare and entangle anything that moves too close to it with its vines. The vines constantly jiggle and sway, unnerving enemies and deterring herbivores that might mistake Tangela for a shrub. 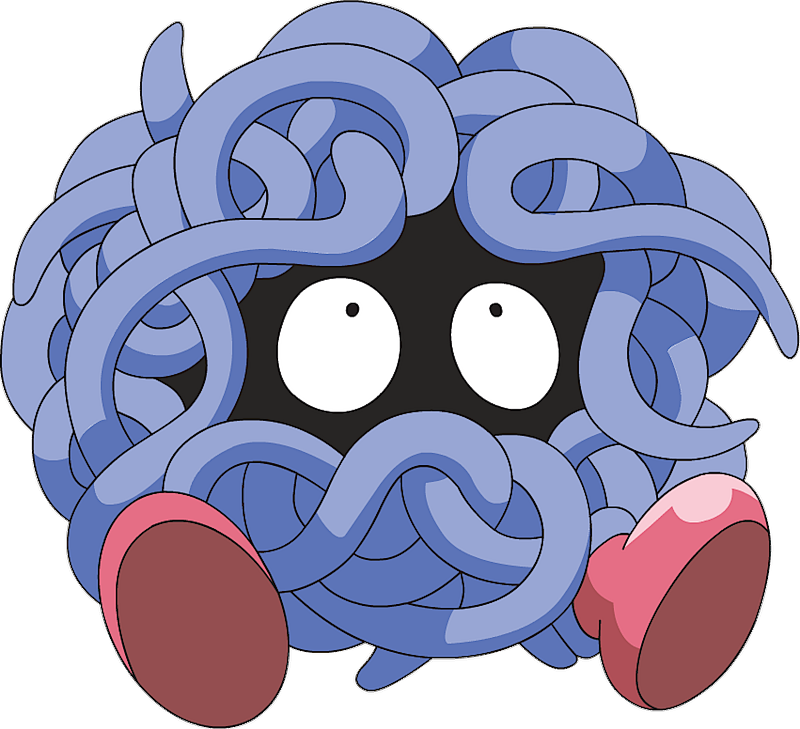 Tangela's vines will snap off easily and painlessly if the target pulls on them, suggesting that the ensnaring is intended to scare off potential predators. Tangela can usually be found in grassy plains. Erika used a Tangela when Ash battled her for the Rainbow Badge in Pokémon Scent-sation!. An Officer Jenny owned a Tangela in Gulpin it Down. A Tangela appeared in Princess vs. Princess battling Brock's Vulpix during the Queen of the Princess Festival contest. Tangela made an appearance in The Kangaskhan Kid. 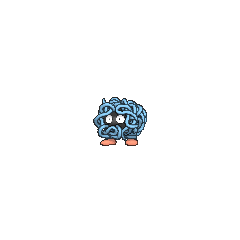 A Tangela under the ownership of Stella appeared in It's Mr. Mime Time. Tangela also appeared in the second original series movie, The Power of One. A Tangela appeared in Beauty and the Breeder where it participated in a Pokémon breeding competition. A Trainer's Tangela appeared in The Grass Route competing in the Grass Tournament. A Tangela appeared in Celebi: Voice of the Forest. A Tangela was one of the Pokémon seen at Wings Alexander's barn in Throwing in the Noctowl. Several Tangela appeared in For Ho-Oh the Bells Toll!. 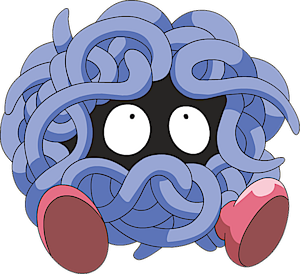 An image of a Tangela appeared in Hocus Pokémon. A Coordinator's Tangela appeared in A Hurdle for Squirtle competing in the Saffron City Pokémon Contest. Tangela first appeared in Sigh for Psyduck as corpses used by Koga's Gastly. Tangela appeared as a silhouette when Green explains about Mew in The Jynx Jinx. Tangela's first real appearance was in Blame it on Eevee like her counterparts in other media, Erika of Pokémon Adventures has a Tangela in her arsenal. 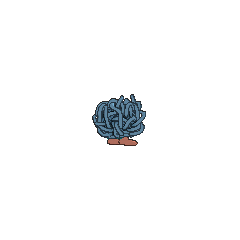 This Tangela goes by the nickname Angela in the English translations, or Mon-chan in Japanese. In A Flaaffy Kerfuffle a Tangela appeared where it was one of the Pokémon in Professor Oak's fantasy when he explains that trainers should only have six Pokémon with them. In The Last Battle XIII a Tangela was one of the Pokémon sent to help the fight in Ilex Forest. Although it is said to live in plains, its Friend Area in Pokémon Mystery Dungeon is the Jungle. Also, its Pal Park area is the Forest. Tangela and Tropius are the only two Pokémon that are not starters or Legendary Pokémon of a previous generation unavailable in Pokémon Diamond and Pearl. They must be transferred forward from a Generation III game or traded from Pokémon Platinum. Monjara may be based on もじゃもじゃ mojamoja (shaggy or unkempt). It may also include monster.